The AK47 is one of the most popular assault rifles out there because it’s easy to identify, it’s simple to use, and is extremely durable (even when it’s cheap). In fact, throughout history, the AK47 is not known as the most accurate rifle; but everyone who’s ever used one (real-steel or airsoft) will vouch for its durability! Also known under the name Kalashnikov (from Mikhail Kalashnikov, the person who made the rifle and started the entire AK family), this real-steel gun is of Russian origins. It was first used by the Soviet Army in 1948 and in 1949 it was officially accepted as part of the Soviet Armed Forces’ arsenal and was used by most member states of the Warsaw Pact. The AK proved to be a reliable companion in the field of battle, withstanding harsh conditions and being extremely easy to use. Furthermore, the gun has low production costs, which is one of the strongest reasons behind its popularity. Back to the airsoft world, all major producers took on making AK47 models for their collection. Most designs are AEGs, but you can also find spring-powered AK47s in an extremely wide range of designs and implementations. Since every brand has a different view on how an airsoft AK47 rifle should look like, I think it’s wise to discuss the most popular models in a try to showcase unique features and different interpretations of a classic real-steel weapon. 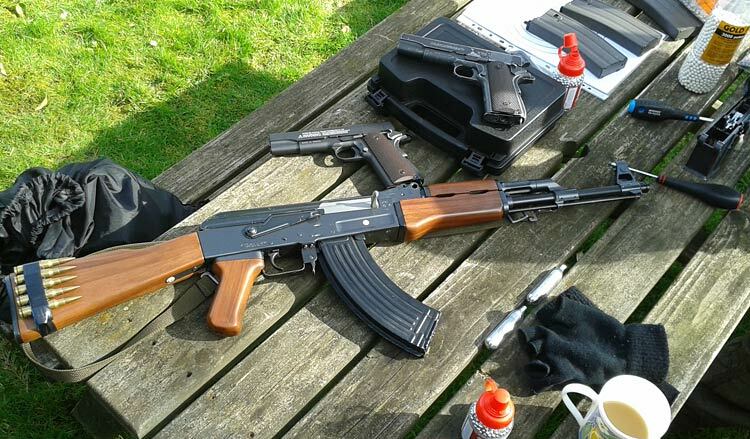 So, if you’re interested in learning more about the best airsoft AK47 rifles, continue reading. The LCK47S AK-47 brings a unique approach to the standard AK47, with a metallic body and real wood accents. Of course, the feature that made the aK47 well-known throughout the world remains, and the LCK47S is just as sturdy and durable as the original that inspired it. LCT included a functional steel bolt catch, to bring an air of authenticity to this replica (besides the stained wood grip and handguard). Unlike the first version used by the Soviet Army, the LCK47S is designed with a steel folding stock, but this feature makes it fantastic for transportation and CQB situations. On the inside, this rifle is equipped with a metal reinforced Version 3 Gearbox (which can be upgraded), a high-tension spring, and other high-quality elements. I also like that the rear sight is adjustable (the front one is fixed) and that the rifle can shoot at about 430 FPS! Overall, this is a piece any collector would love in their quiver! It looks and feels authentic, and the sound is absolutely divine! Kalashnikov decided to create a high-quality replica of the original AK47used in the military, which is why their design comes with a fixed (real wood) stock and AEG Blowback action. The rifle works with one 8.4v 1100mAh NiMH battery and shoots at about 370 FPS. You can adjust the hop-up and both sights for improved accuracy and the blowback system ads a bit of recoil (not like the real deal though). On the outside, the body is a combination of metal and beautifully laminated wood furniture, which gives the rifle a realistic weight and feel. The cherry on top is represented by fully licensed Kalashnikov trademarks, which give this piece of airsoft weaponry a wonderful air of authenticity. The rifle comes with one high-cap 600 rounds magazine, but you don’t have room for a scope or any other accessories. SRC chose to re-create the foldable stock design for people who want an AK47 without spending too much. Thus, the body features a combination of polymer elements and wood imitation (for handguard and grip), but it is still reliable due to the metallic outer barrel. Inside, you’ll find the Version 3 metal gearbox (which shows quality). Also, the rifle can shoot at about 380 FPS, which means it is just as powerful as other similar CQB rifles. The folding stock is of great use in a skirmish and the 600 rounds high-cap magazine will help you lay waste on any enemy team. This is an AEG design, and while it may not be as impressive as the one made by LCT, it still features AK47’s look and reliability! It looks like the real deal and it feels great in your hands due to the full-metal body. The fixed stock and handguard are polymer, but it’s of high-quality so, from afar, the rifle looks authentic. In reality, the combination of materials creates a beautiful airsoft rifle, with a healthy weight, that will resist any abuse in the field. The one-piece barrel assembly, the RIS rail, and the flip-up adjustable rear sight make the JG AK47 one of the best AEG rifles for CQB for both advanced and beginner players. The rifle is powerful (about 410 FPS), uses one 8.4v stick type battery, and the steel Version 3 Gearbox is fully upgradeable. 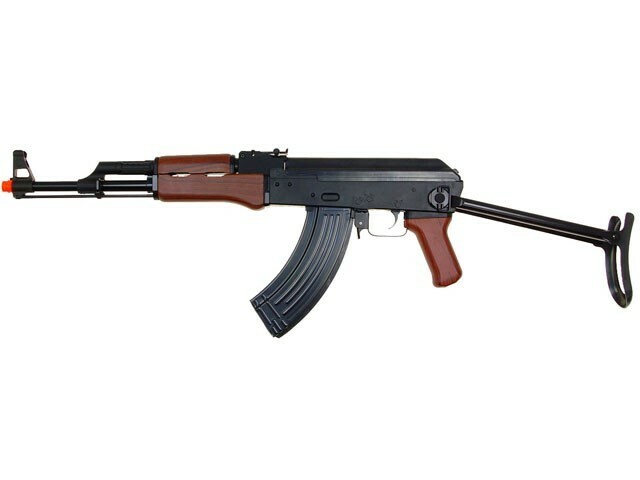 Furthermore, to make sure the aim is accurate, the JG AK47 is equipped with adjustable hop-up. With an improved exterior aspect, CYMA’s AK47 is powerful (380 FPS), has a good rate of fire (660 BBs per minute), and can shoot at over 100 feet. The body and internals are fully metallic, with polymer stock and handguard, and the rifle uses 8.4v NiMH batteries (however, the stock is big enough to house bigger batteries). The rifle also features a built-in hop-up unit for increased accuracy and a metal RIS rail system to add as many accessories as you need. The front and rear sights are metallic and adjustable, and the magazine holds over 600 BBs. The AK47 Spetsnaz is compact, fully-metallic with a polymer collapsible stock, and is extremely easy to use. The rail placed underneath the handguard allows to add some accessories such as a red dot, a forward grip, or a lantern, but that’s about it. The barrel is also metallic, and the gearbox is a Version 3, metallic design. The internals are built to last regardless of your field activity, and the rifle is capable at shooting at about 390 FPS. Still, this is an AEG (8.4v brick battery), so you don’t feel any blowback action. However, the rotary style adjustable hop-up makes up for the lack of action with amazing accuracy! If you’re looking for a cool-looking AK47 on a budget, Double Eagle has the perfect design! With a collapsible skeleton stock and high-cap magazine (450 rounds), their model is rather impressive. The body is indeed polymer, and the RIS rail system (both above and under the handguard) offer plenty of space for accessories. This is an AEG rifle, with adjustable sights and two firing modes (semi and auto) that can be used by both advanced and beginner players in outdoor games. The construction is durable, and the internals will last for as long as possible. If you’re really strapped for cash, this is a cheap version of the mighty AK47 produced for beginners and players who want to taste the feel of holding such a great rifle. This is an AEG, that uses a 7.2v NiCD battery and features a fixed full stock (just like the real deal). While the build is sturdy, the polymer can’t completely imitate the real-steel version, so you’ll notice the rifle is lightweight and rather fickle in action (tends to jam from time to time). Overall, besides looking like an AK47, it also allows for plenty of accessories due to the rail system it features. This may improve on quality a bit, but if you’re truly looking for the authentic feel, we recommend choosing a design with metallic parts. The list of different versions of airsoft AK47’s could continue, but these are most of the brands that made an impact on the market with this rifle. As you can see, some went with the complete replica approach, while others decided to take the road of innovation. However, regardless of the design, the sturdiness and reliability of the rifle are always the features that remain. Overall, we can say that there is an airsoft AK47 model for every budget, but the price shouldn’t be the one driving your purchase. There are lots of affordable designs that come with high-quality build and internals, so don’t rush; make your purchase decision carefully to get the Kalashnikov you deserve!